The attached photo was taken at home over Christmas. (sorry it's not scanned, but a digital photo of a photo). 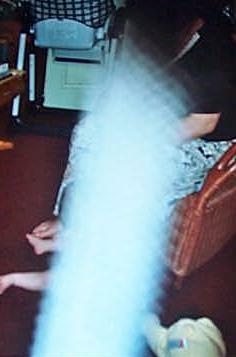 It's of my mother and my baby son, but there is a strange image across the front of it. A lot of photos were taken that day, all others are fine. The image starts blurred, but get's opaque and finally dark across my mother's face. We're not sure of what it is, but my brother passed away 3 years ago, and my mother's father last year.